"For the true donair fan. This recipe is tried and tested. 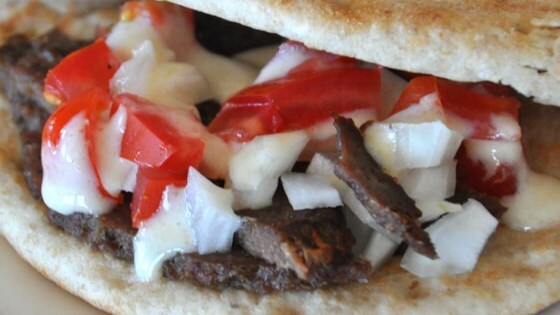 If you enjoy Halifax donairs, then you'll love this recipe. When making this recipe, use only the finest spices available; they make a huge difference." Preheat the oven to 350 degrees F (175 degrees C). In a cup or small bowl, mix together the salt, oregano, flour, black pepper, Italian seasoning, garlic powder, onion powder, and cayenne pepper. Place the ground beef in a large bowl, and use your hands to blend in the spice mixture. If you want the smooth texture of meat that you see in a real donair shop, you must do this in a steel mixing bowl and on a sturdy surface. Pick up the meat, and throw it down with force about 20 times, kneading it after each throw. This also helps the meat hold together better when you slice it. Bake for 1 hour and 15 minutes in the preheated oven, turning the loaf over about half way through. This will ensure even cooking. Serve, or allow the meat to chill before slicing and reheating. This cuts better if you chill the meatloaf overnight before slicing.